Gattinoni red brocade party dress, Rome, 1950s Augusta Auctions Lot: 155 October 24, 2018. One of the best things about auction sites (when compared to museum sites) is that you get far more images of the objects, and often from unusual but helpful angles. This is true for furniture– good auction sites will post photographs of the undersides of sofas and desks, a level of detail museums simply lack the time for. For clothing, construction details aren’t always noted in the record, so we rely on images. This is where the auction sites can really be a boon: turn me round, baby. It’s a wonderful look at the interior of a vintage dress, though, and one that makes replicating this garment (and look) so much easier. Once upon a time, not very long ago, when I worked in a historic house museum, I was asked to present at a conference in Worcester. I chose to talk about these fragments, and I still like to think about them. The delicate fabric was saved as a pair of sleeves, a bodice with a tiny peplum, a skirt. 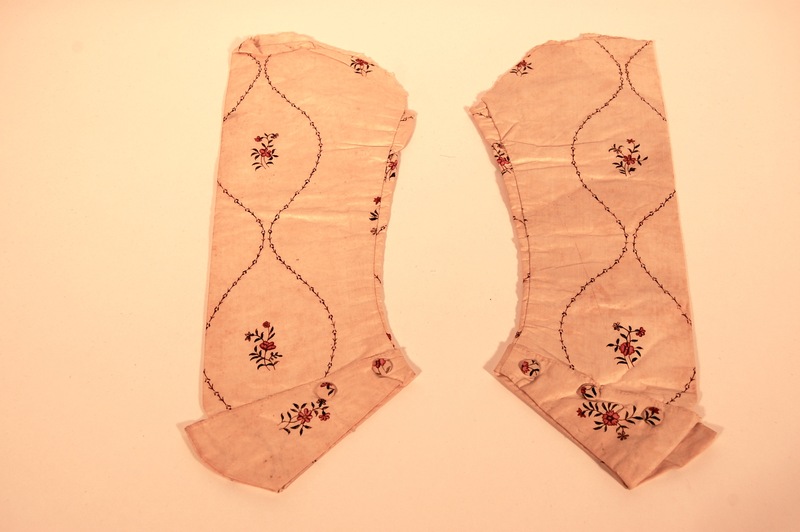 Sleeves, removed from bodice 1990.36.27. The pieces appear to have been part of a pieced-back closed-front gown with a matching petticoat circa 1785. I think someone decided (quite rightly) that the style was too passé for 1795, and altered the gown significantly. Not only is there evidence of new sleeves being fitted into the gown’s armscyes, we have the sleeves-that-used-to-be. And my dear! No one is wearing sleeves like that this season! Skirt panel, painted Indian cotton. Who wore the gown? Was it Sally Brown, born in 1773? And did she alter it, or did her sister’s mantua maker, Nancy Smith? We can only guess at this point, as so many documents remain in private hands. The alterations are not as finely done as the original gown, so I think there are two hands at work here– whose were those hands? There’s always more to think about and learn. Sometimes you’re a jerk without meaning to be, usually because you can’t see past your own limited self. I was that jerk on Friday, when my obsession with a missing package led to unfortunate words with both a supplier and worse, my sweetheart, about an unexpected length of fabric lately arrived from India. Would that my brain would work faster, for by the time I’d figured out what to make of it, the conversation had turned, and an additional 300 miles lay between me and the recipient of my confusion and dismay. Despite my best intentions and resolve, I am a sentimentalist. This instinct sometimes conflicts with a devotion to honesty, for kindness often lies in elision. Confused? Short story: I don’t wear yellow, but a package arrived Friday with a dress length of printed Indian cotton, red and green flowers on a yellow ground. “But Kitty,” you say, “Don’t you crave the hideous, the clashing, and the correct? You applaud Our Girl History’s choice of 1770s fashionable pink, though she prefers blue. Yellow is the haute couleur of the 18th century, fashionable everywhere, even in North America. You should leap at the chance to wear it.” (I was not thinking fast at all on Friday evening.) What made me bend my resolve– what will always makes me bend my resolve? Sentiment, of course, backed by research. 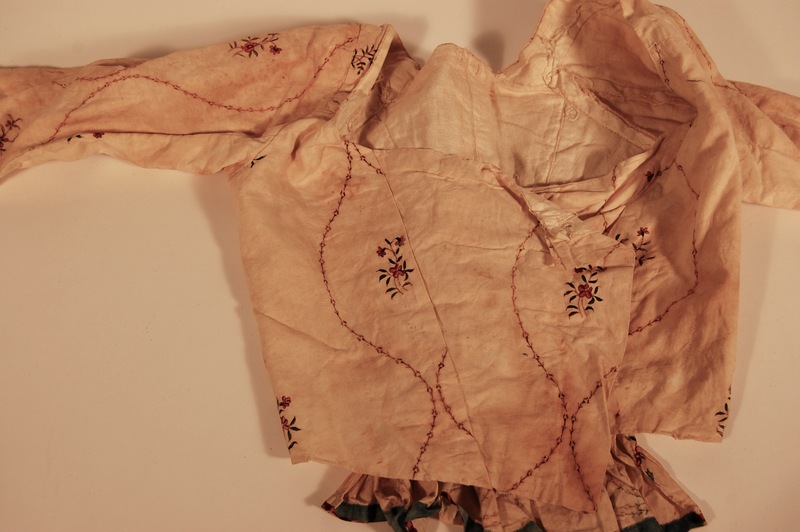 April, that cruel month, brought obsessive searches for Indian cotton print appropriate for the 18th century, as I looked at sample books and extant garments, searching for material to create frankly annoying clothing. Orange and green check with clashing Spencer and bonnet lining isn’t enough: I want to push my representation of the fashion sense of the past closer to truth. People in the past weren’t as matchy-matchy as we are, and their ideas of stylish, attractive, and fashionable were very different from ours. Loud was ladylike, and that’s a style statement I can get behind. Along the way, I ordered fabric in a pink and green (a departure itself) floral print on white ground, yardage now long overdue. A friend has been dabbling in these same waters, and made up a new gown for Mount Vernon, satisfyingly loud and clashing with our modern sensibilities about the past. Our mutual friend, also at Mount Vernon, assisted her in choosing a dress length for me, and reader, I was confused and lacking when it arrived. But like any good curator in a social history museum, it was the story that got me. How can I resist a gift from a fellow enthusiast in a pattern chosen by my sweetheart, on the grounds that I don’t wear the color? Reader, I cannot. Think of Cranford, of lengths of dress muslin requested and never received, and the sentiment embodied in that fabric. Think of women in Providence craving an India print gown, of lovers, husbands, sons, ordering dress lengths at trading ports thousands of miles and long months from home. Think of the affection and thoughtfulness embodied in textiles brought back months after they were requested. Complex meaning is woven into that cotton, giving this dress length interpretive meaning before it is even a garment. Now what? Now I have to decide which century/event this gets made up for: 1812-1817, 1778, 1804, 1768. There are many choices, but with the meaning embedded in the fabric, I’m most inclined to make something I’d wear often– not that this is particularly housekeeper-appropriate. And about the research you ask? Yes, small floral print on colored ground is documentable to the 18th century. While early and European, here’s an example of an Indian motif translated by Dutch makers for printing in Sweden. 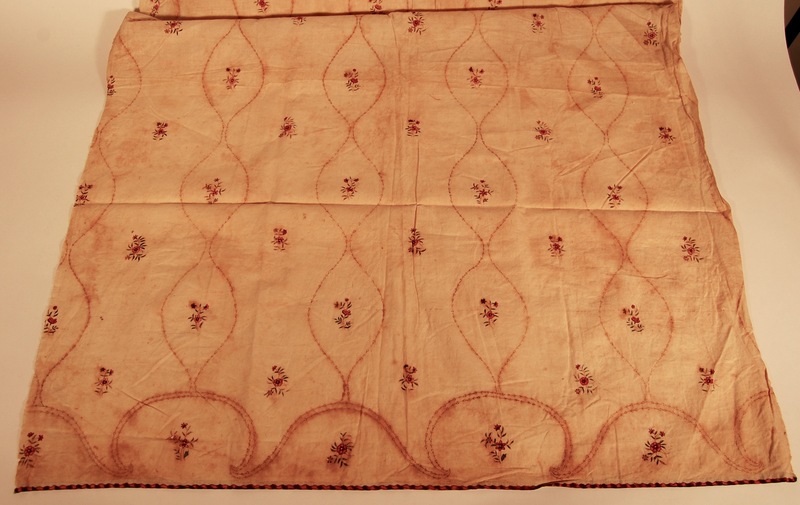 Rhode Island merchants traded in the Baltic, so given the early date of this fabric sample, its arrival in North America could predate 1788 and John Brown’s first ship to China and the far east trade. Possible? Yes. Probable? We can have a lively discussion, in which I will point out the Brown’s love of all things French and French translations of bright, small motif print patterns. The printing factories in Sweden ran until 1771 and produced at least two relevant prints. Would my successful Presbyterian farmer have bought something like this for me in New York or Philadelphia? Would I have worn something so bright and loud? Am I overthinking this? Perhaps, but yellow is a new thought for me. With especially fond thanks to Miss N and Drunk Tailor, to whom I also owe an apology. Some days were made for a bit of hooky. This week, it was Tuesday– though how much can you consider a museum visit hooky when it’s the business you’re in? We took an outing down the street to the RISD Museum, long one of my favorite places in Rhode Island. The Costume and Textiles curatorial staff mount some amazing exhibits, from Artist Rebel Dandy to this latest, All of Everything: Todd Oldham Fashion. Every time I go to the RISD Museum’s exhibits, I have serious wants, whether mochaware coffee pots or the Chinchilla Outfit– which my grandmother would also have coveted. There was a tinge of nostalgia in the visit, since most of us had lived through the 1990s, and recognized the styles that eventually leached into ready-to-wear from couture. Cropped sweaters. Shrunken jackets. Embellishments. Pattern mixing. Hey– I still dress that way! Another outfit my grandmother would have loved. And legit it is, this pattern mixing. Funny how we stick to the same shapes and forms once we find what we like; so much of what I make and wear are variations on similar themes, no matter the century. For some, dressing in the past is the only time they’re dressing up; their daily style is almost aggressively (or passive-aggressively) anti-style. But when the top hat comes out, look out: they’re dressed to the nines.